You are the terrible lizard, T-Rex! Click here to play! Thunder across the plains and be the terror of every other dinosaur that crosses your path. None can stand against you and your kind. You simply tear apart any opposition with your horrifying teeth and jaw strength that crushes bone with ease. Let out a mighty roar and strike fear into the hearts of your prey! A challenger may arise if you allow it, though. To stop this, you must track down dinosaur eggs and destroy them. For this, you will be rewarded with more prey to consume, as the parents come running back to the nest only to find themselves up against the might of a T-Rex. Rule the Jurassic era with your strength and fearsome gnashers! T-Rex gives you the power of one of the largest land predators ever to stalk the earth. 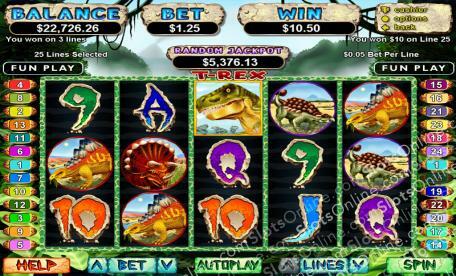 Crush the weaker dinosaurs under foot and feast upon the riches of the prehistoric world in the T-Rex slots.